I had a craving for a Reese’s Peanut Butter cup. Who am I kidding, I could always go for one because they are one of my favorite candies. Sadly, they are not diet friendly. I’m still on my quest to lose weight so that’s not an option right now. Since I had the craving, I made the next best thing, a peanut butter and chocolate shake. In general I refuse to feel guilty for eating something “bad” (all things in moderation, right? ), so this is a healthier version of what you’d find at your local ice cream shop because I skipped the ice cream and added a frozen banana instead! Yes, there is a banana in this recipe. I left it out of the title for two reasons. One, it made the title too long. 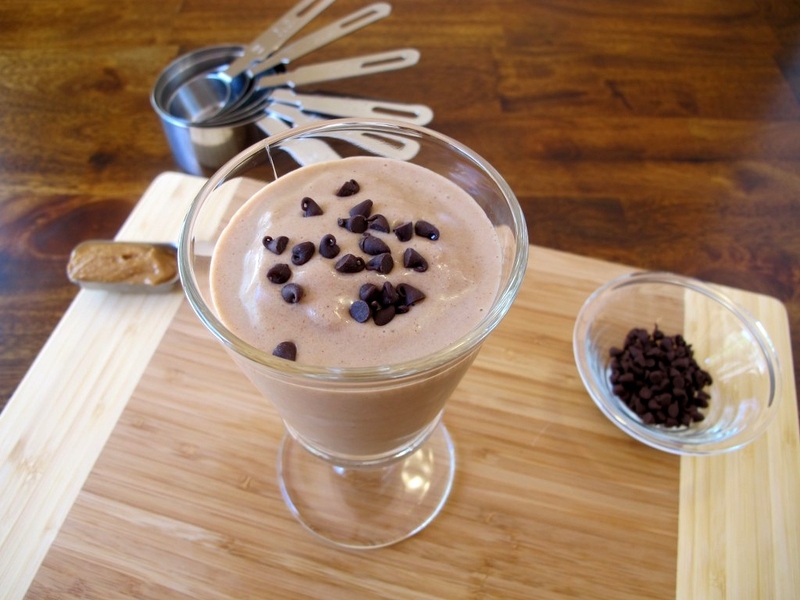 Two, the peanut butter and chocolate are the dominant flavors in this amazingly delicious shake. There is a hint of banana flavor here but I mostly love it because it makes this shake so thick and smooth. It’s a great substitute for ice cream. 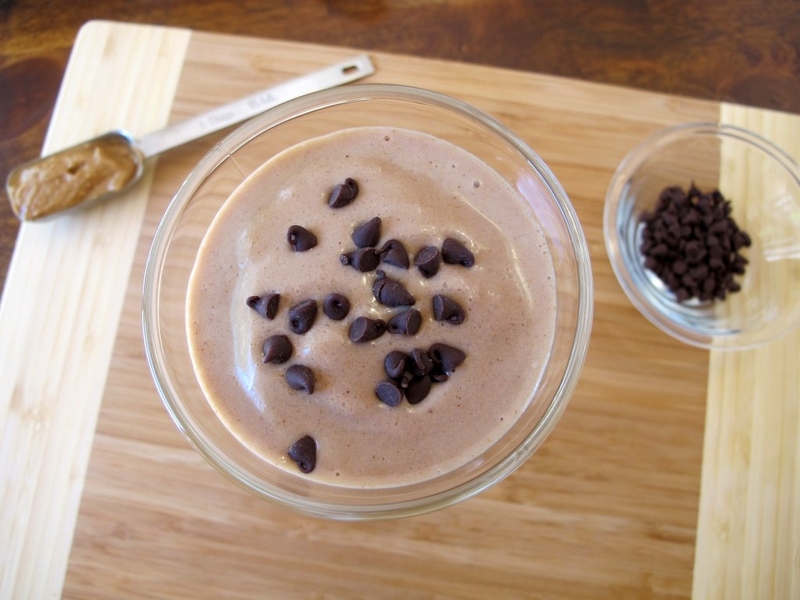 Put all of the ingredients (except the mini chocolate chips) into a blender and mix well. I was multi-tasking the morning I made this shake so I forgot to take pictures of the process. Hehe. I’m not always the best multi-tasker. 😉 It’s a good thing there is only one step to this recipe so I don’t feel so bad because all you’re missing is seeing the ingredients in the blender. Can you picture it? 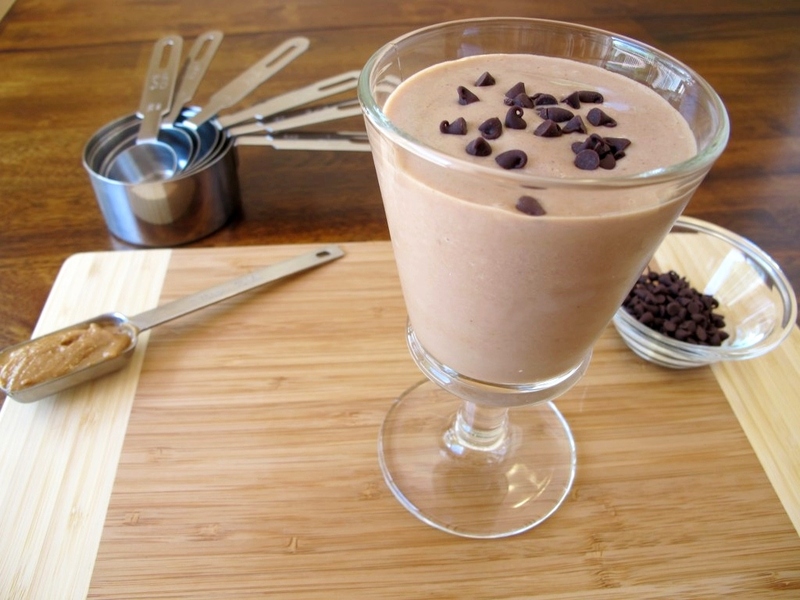 This recipe may be missing some fatty ingredients but the shake is not missing a beat on the flavor. The peanut butter is a great source of protein and it tastes great. 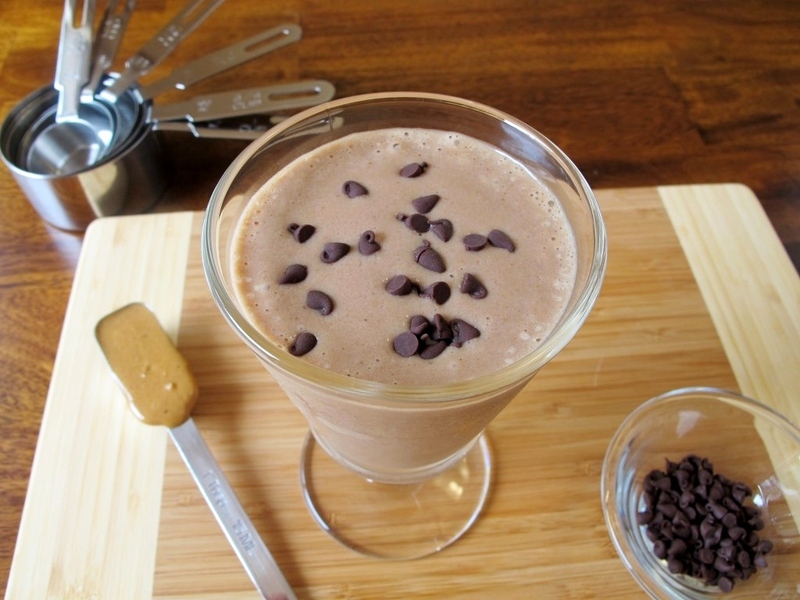 This shake is definitely a must-have for all you peanut butter fans. I’m slightly addicted to chocolate syrup. I may or may not have been known to consume it like I was taking medicine with a spoon. 😉 Due to my “problem” we don’t usually keep liquid chocolate magic in the house. 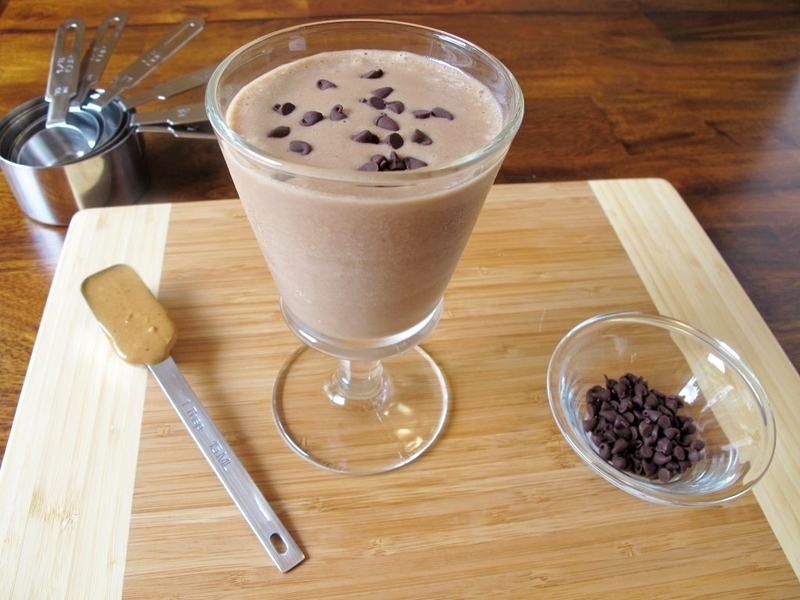 Trust me when I say I would have loved to put a ton of it this shake, but a tablespoon is enough to get that sweet chocolaty essence without making it terrible for you. The mini chocolate chips are not exactly a healthy ingredient but they are just for garnish. Plus, they are so seriously cute! I have to point out my nifty new measuring cups from King Arthur Flour in the back of the picture there. It’s a lovely store located in Vermont and you can order from them online too. In fact, you may have seen this brand in your local grocery store because they are famously known for their varieties of flour like their all-purpose flour. Looking for other fabulous shakes? 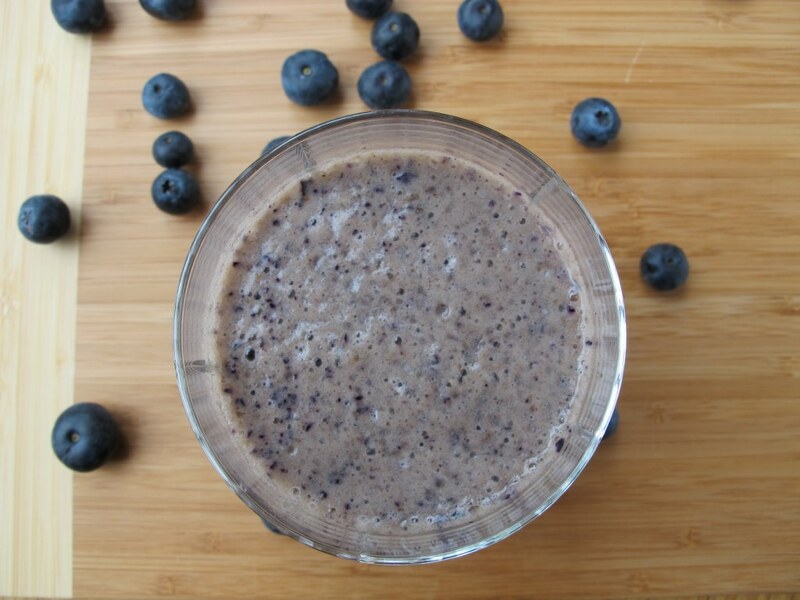 Try my Skinny Banana Blueberry Shake. 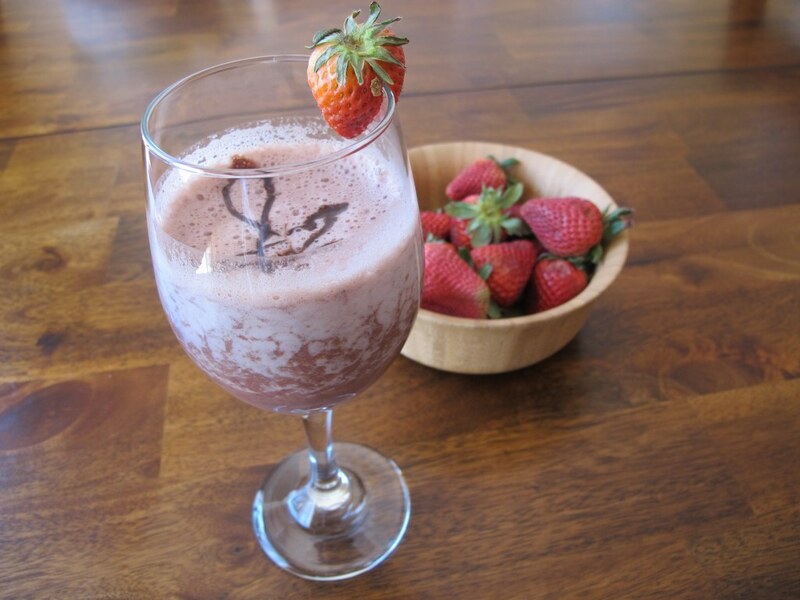 Or a Skinny Strawberry Chocolate Shake. 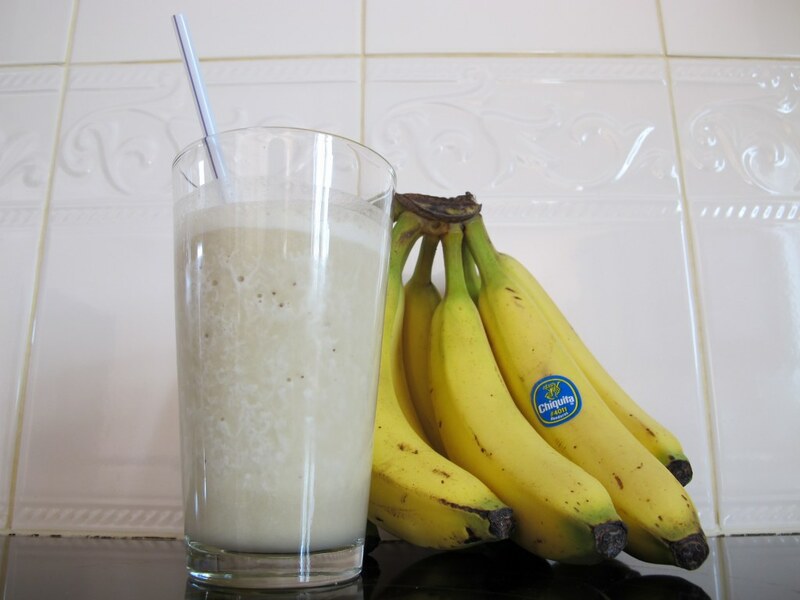 Or even another kind of banana shake, like the Banana & Peanut Butter Smoothie. Note: Not a paid advertisement for King Arthur Flour. I’m just sharing my opinion. We’re on the same page, I have been craving peanut butter cups and peanut butter ice cream! I am giving this a try! This sounds delicious! And with the banana in it, I bet gives it a great texture and taste! Love PB! I’ve had it everyday for the past week. So good! And you’re so right, that banana does amazing things to give it great texture. 🙂 Hope you are enjoying your weekend!